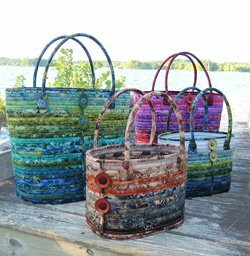 Beautiful zigzag stitched bags, no shaping required! Simply made from a rectangle for the sides and an oval for the bottom. We will be making the Medium bag in class using just 20 Jelly Roll strips. The construction is similar to that of the Jelly Roll Rug and is easier than you might think!